I've a Rpi 3 Model B V1.2 with an Intenso 16GB Micro SD HC (up to 90 MB/s) running a RASPBIAN JESSIE LITE (Rel. Date: 2016-05-27), power is supplied via USB by a Linux machine. The system worked correctly for about a week, but since yesterday the webserver and ssh were not working anymore, although the previously installed VPN was/is still connecting to the VPN Server. Apparently the power of RPI was taken off without it first shutting down correctly (not 100% sure about this). 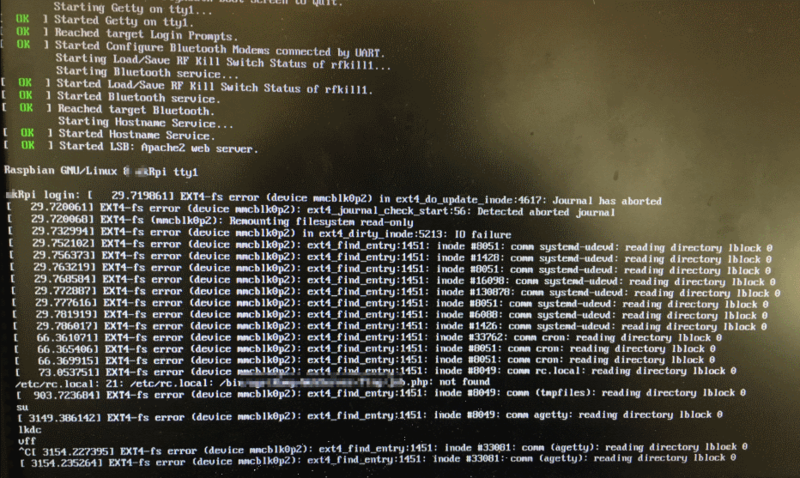 Today I connected a monitor and find out that the boot is stucked on EXT4-fs error (see attached image), I tried to login but this is not possible, everytime I type something a new line with error appears. Take out the microSD card from your RPi, plug it into the card reader and try to backup your files on the laptop. Then you can either attempt to fix the filesystem of the card with fsck (again, on the laptop). If you're unable to fix it to a bootable state, you'll have to reflash the microSD card with the image and start from scratch. Not the answer you're looking for? Browse other questions tagged raspbian boot-issues or ask your own question. How to access the RPi root ext4 file system by inserting SD card into a different computer?